REDDING, Calif. - The Simpson University Music Department invites the community to ring in the holiday season by attending its annual Christmas concert on Sunday, Dec. 4. 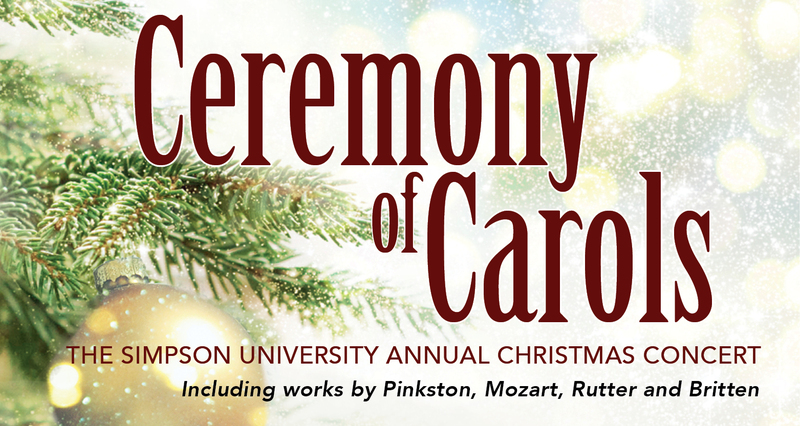 “The Ceremony of Carols” will be held at 3 p.m. inside the Grant Student Life Center (formerly the Heritage Student Life Center) on Simpson’s campus, 2211 College View Drive. Doors open at 2:15 p.m. This concert will include performances by the Simpson University Chorale, the Trinity Repertory Singers, and the Shasta Symphony Orchestra, and music by Mozart, Rutter, and Britten, as well as Tchaikovsky's Sleeping Beauty Suite. It will also feature “In This Great Expanse,” composed by Dr. Dan Pinkston, professor of theory and composition and head of the Music Department. Attendees will have the opportunity to sing Christmas carols accompanied by the orchestra and enjoy Christmas-themed refreshments. The cost is $10 general admission; and $8 for seniors and students. Local high school students with ID are free. Tickets are available online at simpsonu.edu/concerttickets, the Simpson University bookstore, and at the door. For more information about Simpson University’s Music Department, visit simpsonu.edu/music. To learn more about upcoming concerts, visit simpsonu.edu/musicevents.